It’s a good time to be a banker with government clients in the Gulf. It’s a good time to be a banker with government clients in the Gulf. There is significant interest by Gulf governments in sovereign debt, in the form of bonds and loans. Banks stand to earn generous fees from extending loans, issuing bonds, and serving as arrangers on a host of privatization plans and corporate restructurings. There is also a bit of time pressure to secure funding. Pressures emanate from domestic and international sources. 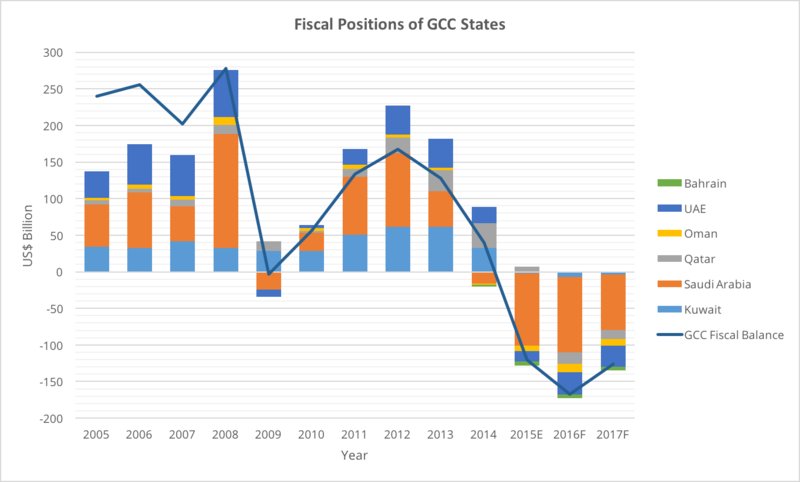 Domestically, the fiscal budgets of the Gulf Cooperation Council states are in deficit and governments are seeking new ways to generate revenue. Most GCC states are well-positioned to tap international capital markets, either borrowing in bank loans or issuing sovereign bonds. Gulf states in the last year have expressed a preference for approaching local bank sectors for their financing needs first, but now they are branching out. The time pressure to access international lenders and arrangers emanates from credit rating agencies, which are closely watching the Gulf states’ fiscal balances, but also their reform processes and business cycles. Credit worthiness is a basic assessment of the ability to repay debt. There is a strong possibility that rating downgrades are forthcoming for Saudi Arabia and Oman, if not others, so the sooner Gulf states can access loans and issue sovereign bonds, the better interest rate they will be able to secure. For Bahrain, it may be too late, as its credit rating was downgraded by Standard and Poor’s to below investment grade earlier in 2016, though Bahrain’s credit rating by Moody’s remains slightly higher. That does not mean that credit is inaccessible, just that it is more costly. The roadshows underway now for Abu Dhabi debt (which is rated separately from Dubai debt) are testing the water for international appetite for Gulf loans and bonds. Abu Dhabi began a presentation to investors in London and the United States on April 20. As the first U.S. dollar bond debt for Abu Dhabi in over seven years, the bond will be sold to investors in the United States and Europe by a team of investment bankers from Bank of America Merrill Lynch, Citigroup, and JP Morgan. Meanwhile, Saudi Arabia has secured $10 billion in bank loans from a consortium of international banks, many of them based in Asia. The rise of Japanese banks into Gulf debt markets is also a new trend. Qatar is seeking to issue another bond on international markets, after a $5 billion loan raised in 2015. 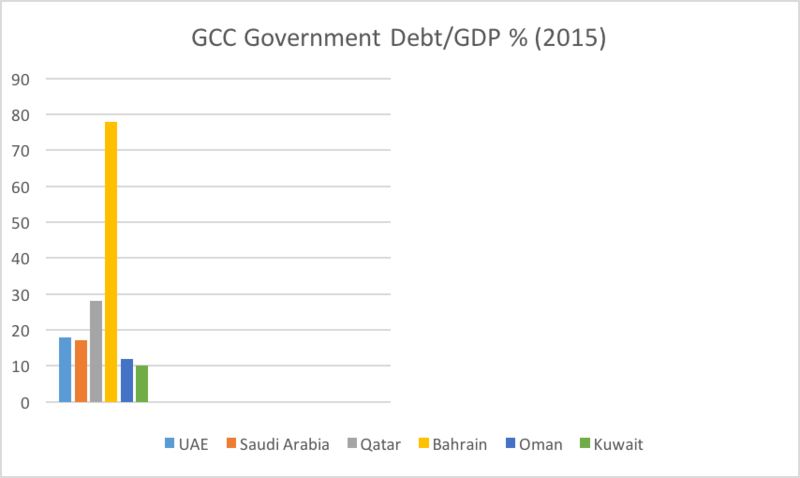 Government debt to gross domestic product ratios among the GCC states are generally very low, so approaching debt markets is a sensible way to bridge the current fiscal gap. However, how do the Gulf states envision future sources of revenue to cover these debts and continue the expansion of their economies? This year will be an easy year to borrow; but establishing a pattern in borrowing carries certain risk. A continued reliance on hydrocarbons will entrench these patterns of government expenditure in the public sector and in state-related enterprises that fund deposits in local banks and perpetuate a cycle of commodity boom-bust lending, making local economies vulnerable to price shocks. The good news is that international investors in sovereign bonds tend to have a short memory. Argentina has also re-entered international debt markets this week, with a $16.5 billion bond to be repaid within 10 years. There was tremendous market interest in the debt, with orders for the bond going over $25 billion. In turn, Argentina was able to secure a lower interest rate on the debt. This could signal that investors have not tired of emerging market sovereign debt, though some worry that the trillion dollar bubble of investment over the last decade is headed for collapse. The Gulf states will join a long list of developing countries that have found international banks very willing to help them bridge budget deficits, reminiscent of the period of the last oil boom in the 1970s that led to increased lending to emerging markets that came to an abrupt halt with the 1980s debt crisis. All good parties must come to end, which is all the more reason for the Gulf states to access markets before it is too late, or too costly.